May is National Bike Month! The Bicycle Master Plan team continues to accept comments on the statewide bicycle recommendations mapping. The Team is putting the final touches on a draft report which will be available for comment soon. Thanks for your suggestions! Bicycle Project Prioritization has been a big focus this month. A system for scoring projects based on how well they can meet the goals of the network is under development. This will help the team rank projects and provide a systematic approach to building our future bike network. The Long Range Transportation Plan team continues to work with stakeholders to identify needs and solutions to the diverse transportation challenges faced by the state. The Planning Framework for the Long Range Transportation Plan is available for review. The framework establishes a vision for the plan, sets goals & objectives, identifies strategies to achieve goals, and metrics for measuring the success of the plan. This framework is based on public feedback, aligns with work being completed by partner agencies, and is supportive of other planning efforts in the state. The Bicycle Mobility Plan team has also used public input and valuable feedback from their energetic advisory committee to establish vision, goals, and objectives for the plan. The vision, goals & objectives have been critical to developing treatment and implementation recommendations. Review the Plan goals. Bicycle Network Recommendation maps have been drafted highlighting candidate corridors for bicycle infrastructure improvements and potential treatment options. Check out the maps to see what we have in mind. Check out the Documents Page to review summaries of what we heard and what we learned at our January Vision Workshop. 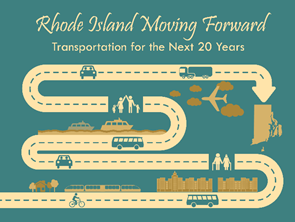 Your feedback is helping to shape the vision for transportation in Rhode Island. This month we worked closely with our stakeholders to draft a set of performance measures for the LRTP and for the BMP. These measures will serve as our report card moving forward and enable us to determine what progress we are making toward achieving our goals. The Bicycle Mobility Plan team has also been meeting with stakeholders to complete a map of candidate bicycle treatments statewide that will complement the vision for this plan. Thank you! We want to thank everyone that came out to meet us in South Kingstown, Providence, and Newport for our Vision Workshop Series. We received lots of valuable feedback and look forward to refining our vision and goals. Grab your calendar! The Vision Workshop Series has been scheduled for January. We hope to see you there to hear your thoughts transportation for the future! Visit our Meetings page to learn more. In December the project team began focusing on future scenarios for the Long-range Transportation Plan. The purpose of these scenarios is to consider different future conditions or environments that we could be living in and the associated transportation impacts. We look forward to refining this work with the public at our January Workshops. The project team completed a draft of the Transportation Trends Report reviewing many of the external trends that can impact transportation and vice versa. Look for a draft of this document here next month! In November the project team met with some key stakeholders with a strong interest in transportation including: Greater Providence Chamber of Commerce, the Rhode Island Chapter of the Women’s Transportation Seminar (WTS), and the Governor’s Chief Resiliency Officer Shaun O’Rourke, and the Governor’s Commission on Disabilities. Feedback from these diverse and passionate groups are key to our plans! The project team continued to draft Baseline Condition Assessments of the transportation network and review trends impacting transportation. Look for drafts of these documents next month! This month the project team continued outreach efforts by taking a local approach. We chatted with folks about their transportation experiences at three farmer’s markets (Kennedy Plaza, Armory, and Slater Park). This also gave us another platform to get the word out about our online surveys! September was an eventful month for public outreach. We met stakeholders across the state, and hosted three public workshops. Feedback from our five county municipal workshops on the topics of Economic Development, Bicycle and Pedestrian Transportation, Public Transportation, Safety, and Resiliency can be found on our Documents Page. The Narragansett Times highlighted the project and some discussion from our Narragansett meeting on September 25th. In September two surveys were released for the project. They can be found on our Get Involved Page. We are looking for everyone’s feedback on general transportation and cycling habits, behavior, needs, and challenges around the state. This month the project team has placed a strong focus on the Bicycle Mobility Plan. Recent efforts include preparing for the upcoming statewide data collection program and finalizing an Interactive Bicycle Mapping tool that allows the public to share their thoughts on opportunities and challenges to cycling in Rhode Island. Public outreach and participation continues to be the focus of LRTP efforts over the past month. The project team has been planning for a busy September. During the month of September the project team will meet with municipal representatives from across the state, leadership from key state agencies, the Governor’s office, and round out the road show with our first public workshop series. The theme of this workshop series is Discovery, we are looking for everyone’s input on the current state of our transportation network including challenges and opportunities for improvement. Come out to talk to the project team at any one of three Discovery Public Workshops across the state: Blackstone Valley Visitor Center, Pawtucket on September 21st; Narragansett Town Hall on September 25th; Burnside Building, Bristol on September 28th. Hope to see you soon! Over the past month the project team drafted the project Public Participation Plan. This plan documents the steps that will be taken to ensure that the public and transportation stakeholders will have an opportunity to participate in the development of the LRTP and contribute observations, concerns, and knowledge. Once finalized the Public Participation Plan will be available to download on the Documents Page. During the month of July the Rhode Island Moving Forward project adopted a project logo and launched a refreshed website, a facebook account, and a twitter account. All of these steps have been taken to help the public identify the project and provide various outlets for discussion. On June 8th the project team met for the first time with the State Planning Council. This 26-member group will review the planning process for the LRTP and the BMP, decide whether to approve the final plan and oversee Statewide Planning’s implementation. In the last month, the Project Team focused on the data that each agency contributes to this project, and how those resources can be used to build a strong foundation for the project moving forward. These discussions have resulted in the formation of a Data Team focused on information-sharing across agencies and modelling transportation operations. Launched the www.PlanRI.com website. This website will be a hub for information on the Long-Range Transportation Plan and Bicycle Mobility Plan progress. Visit the project here for updates and events! Project meetings were held to introduce the project to key stakeholders and begin the engagement process. By engaging stakeholders early in the planning process and maintaining open communication moving forward the project team hopes to develop a plan that all agencies can adopt moving forward. The project Launch Event took place on April 21, at the PAFF Auditorium, at URI Providence Campus. This well-attended event was a great opportunity to start a dialogue about transportation in Rhode Island across modes, communities, and user groups. See the presentation slides. The project team made its first presentation to the Transportation Advisory Committee (TAC) for the Long-Range Transportation Plan. This committee is made up of local officials, state agencies, organizations representing a variety of transportation interests, citizens from different areas of the state, and the Narragansett Indian Tribe. The TAC will serve as the LRTP’s main steering committee overseeing the planning process. The TAC was established by the State Planning Council in 1994 to advise on transportation planning.